VeoRide’s stoked to be the first mobility share to serve the University of Illinois community! Beginning in early August, this area will be home to the largest concentration of VeoRide bikes to date, with 500 at the start. The community has had bike lanes for years, and the infrastructure just continues to get better to encourage cycling. mobility sharing has been a long-term goal for the campus, and with the recent agreement of uniform rules for mobility share operations among the cities of Champaign and Urbana and the University of Illinois, that goal is now a reality. You can’t miss our bright turquoise bikes, which will be in several spots across campus and in Champaign and Urbana. These bikes are the best in the mobility share industry, with sturdy construction, comfortable seats, precision gears, run-flat tires, solar lighting and more. “With our dockless mobility share, riders can rent a bike as needed, ride to their destination, and simply park in a rack or area like you would with your own bike,” said Jonathan Crawford, VeoRide national market launcher. To use VeoRide, riders simply download our app to set up an account, then pay as you go for as little as 50 cents for 15 minutes; or they can take advantage of discounted rates for daily, monthly and annual passes. Students and faculty rates will be lower. We are eager to get rolling in Urbana-Champaign and serving new and returning U of I students this fall with sustainable, healthy transportation that’s easy to use and builds community! 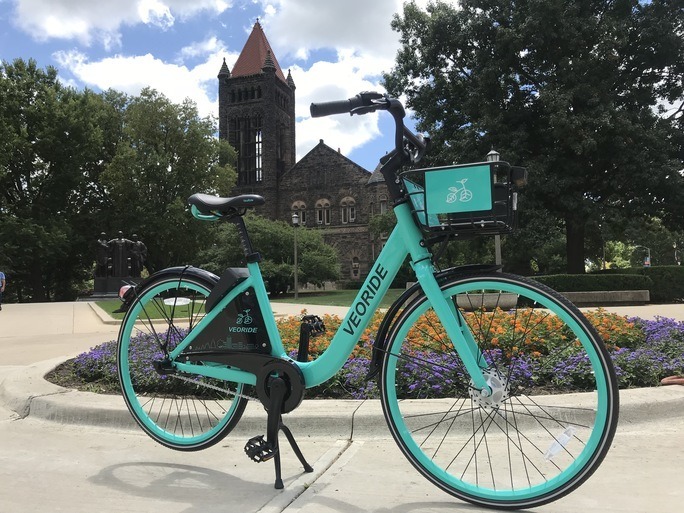 For more information on the University of Illinois mobility share, look for VeoRide partnering with Neutral Cycles every Saturday morning at the Champaign-Urbana farmers’ market. We’ll also be present at several upcoming events, including Move in Night on Aug. 23, Quad Day on Aug. 26 and Light the Night on Sept. 20. To keep up to date on upcoming launch events, and learn more about renting and bike, rates, and money-saving offers, go to www.veoride.com.